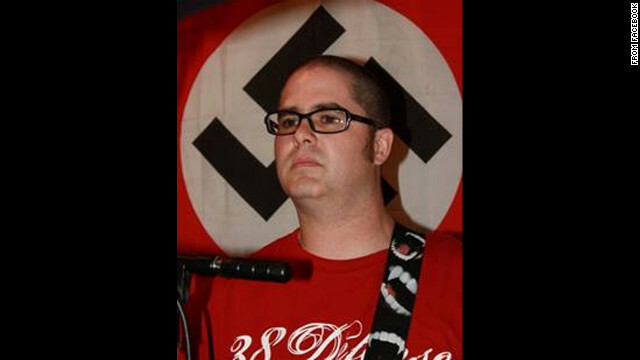 Wade Michael Page appears in a photo taken from a Facebook page that has since been taken down. Wade Michael Page, who police say fatally shot six people in a Sikh temple in Wisconsin on Sunday, died that day from a self-inflicted gunshot wound to the head after he was shot in the stomach by a responding officer, Teresa Carlson, the special agent in charge for the FBI in Milwaukee, said Wednesday. Police previously said that he was shot to death by an officer responding to the attack in Oak Creek. Page, a 40-year-old Army veteran who neighbors say played in a so-called hate-rock band, was the lone gunman in the rampage at the temple, police said. Let's all just go back home to Africa. Regardless of whether he shot himself or a peace officer whacked him, an overewheming number of individuals are yammering about the money saved in court, money saved not having to serve prison saving tax money. One shload of tax money was spent on law enforcement having to deal with this animal in the first place. Money spent to preserve a crime seen and launch a homicide investigation. Money spent to bring the help of the Feds in (room and board, and meals), ect. Money spent on multiple rescue squads and paramedic teams. Money spent in hospital expenses (surgeries,ect). Money spent in funerals. The court cost and stay in prison IS A SPIT IN THE BUCKET COMPARED TO THE EXPENSE OF ALL OF THIS PLUS MORE!!! I know I'm a little off the reservation with this, but I would bet the damage estimates of what that one man did in that movie theater are into the several millions of dollars. Needless to say the loss of life, you can't even put a dollar amount on. The court cost and prison stay is nothing more than a 50 cent tour of prison life for that pr!ck. With the shooter dead, we will never find out why he went mental and did what he did. There never is a good explanation to insanity. Thoughts and prayers to all the victims and their families and friends. Began as gentle, kind child. If we knew of the stressors acting upon him we all would know what to avoid to keep from his misery. Our surrounding, companions and music affect our lives. Choose carefully. Do not carry bigotry or attempt to judge character by color. Truth lets us find understanding and lose the burden of anger between peoples. Stop hurting each other. Attractive element of content. I simply stumbled upon your site and in accession capital to assert that I get actually loved account your blog posts. Any way I will be subscribing to your feeds and even I achievement you get entry to consistently fast. I've been exploring for a little for any high quality articles or weblog posts on this sort of house . Exploring in Yahoo I eventually stumbled upon this site. Studying this info So i'm happy to convey that I've an incredibly excellent uncanny feeling I discovered just what I needed. I most no doubt will make certain to do not overlook this site and provides it a glance on a constant basis.